A unique eye complex which specifically formulated for the delicate eye area. Helps to diminish the appearance of puffiness, dark circles, fine lines with healing minerals, anti-oxidants and herbs ingredients. This herbs-based eye cream significantly increases cell renewal and deeply hydrates your eye area to retexturize and renew the skin without irritating the delicate eye area. *apply it around the eye area, massage with inwards circular motion until fully absorbed. Use it twice a day. This blue-ish gel-cream is formulated with rish oxygen ingredients to revive fatigued, salow, stressed skin and uneven skintone. This gel-cream also helps normalise the secretion of sebum and maintains a balance hydration level of the skin cells. Get yourself a oxygen-treatment with this cream to give your skin an immediate oxygen boost to improve on skin clarity, radiance and luminosity. * apply it to the face and neck area in the morning and evening before moisturizer, with light circular massage motion. Hydrating Serum - This age defying Hydrating Serum helps to diminish the appearance of fine line and wrinkles, Hyaluronic acid increases skin’s ability to retain moisture while botanical extracts nourishes the skin. Direction : After cleansing, apply with a gently sweeping motion and gently massage into the face. 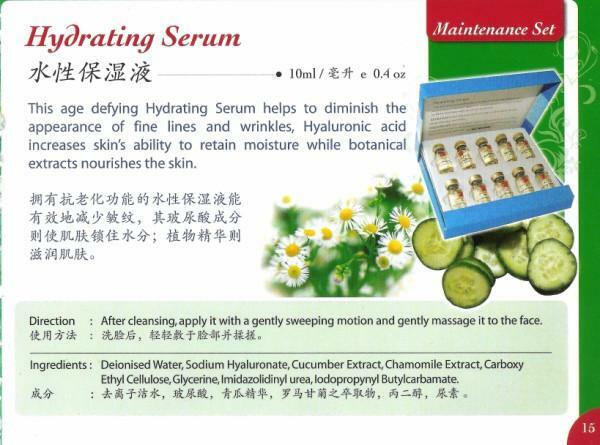 Ingredients : Deionised Water, Sodium Hyaluranate, Cucumber Extract, Chamomile Extract, Carboxy Ethyl Cellulose, Glycerine, Imidazolidinyl Urea, Iodopropynyl Bulylcarbam ate. Ia membantu mengurangkan garisan-garisan halus dan kedutan pada wajah, kandungan asid hyaluronic dapat meningkatkan kebolehan kulit untuk mengekalkan kelembapan, manakala ekstrak botani pula adalah untuk memelihara kulit. A strong and specially formulated product to remove stubborn blackhead, use it everyday to keep your face free of blackheads and whiteheads, leave your skin clean and clear from rough surface. 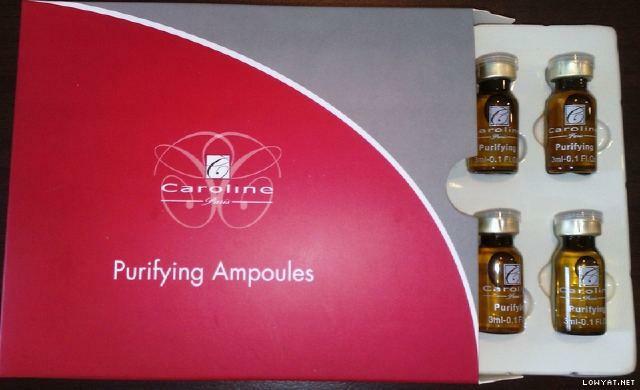 a combination of herbal and botanical extracts known to be effective for comedone treatment. Concentrated formulation to soften and clear stuborn blackheads/whiteheads.Regular application helps to dissolve away keratin impacts in comedones. This complex also has anti-inflammaroty and anti-bacterial effect. *half spray to your palm and only apply to the area that has got inffections, blackheads/whiteheads. If skin softener cause rednes on T zone, then don't use too much, use less less and skip 2 or 3 days. Please apply aloe vera gel or soothing serum on redness area and wait all redness gone, then only can apply skin softener again. 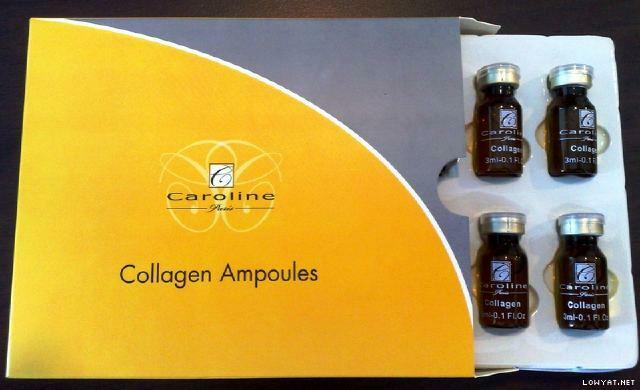 Supply collagen which was losing from old age skin, smoothing wrinkle, moisturizing. Apply on face and neck after toner or washing face. Ingredients : Purified water, Carborner, Hydrolyzed Soy Protein, Imidazolidinyl Urea, Glycerin, Allantoin. It help to purifies skin for a clear and radiant complexion. Apply and spread evenly on cleaned face until fully absorbed. 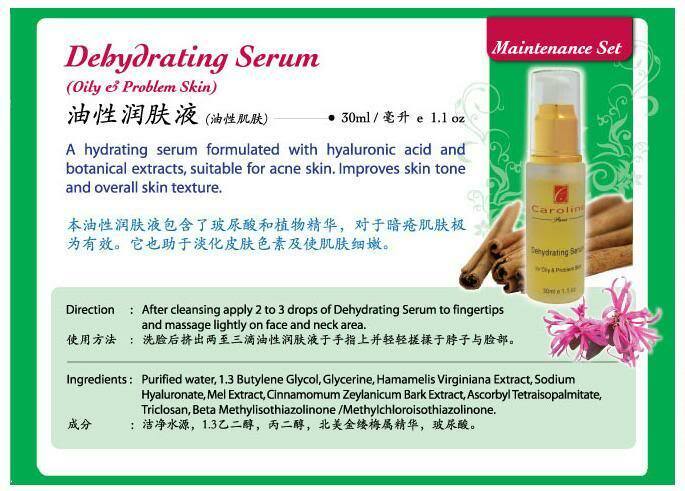 Ingredients : Purified Water, Carborner, Aloe Vera Powder (200 : 1), Rosemary Extract, Imidazolidinyl Urea, Gycerin, Allantoin. 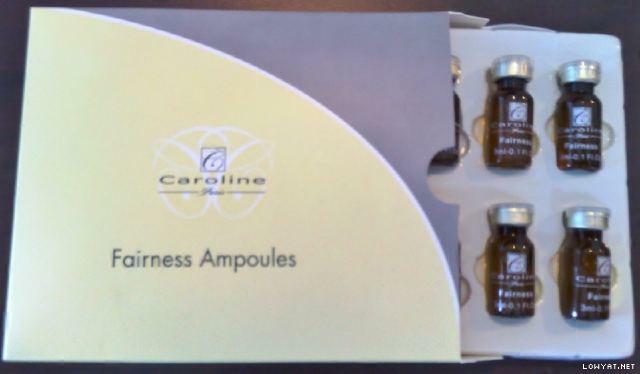 Fairness Ampoules - Comprehensive formulated to make your skin fair and bright while revitalize your skin like baby. Apply and Spread evenly on cleaned face until fully absorb. Ingredients : Purified Water, Carborner, Licorice Powder, Imidazolidinyl Urea, Glycerin, Allantoin. Cleopatra slept in a mask of gold every night. The Queen of the Ching Dynasty had gold rolled on her face everyday. All these are done purely on the basis that pure gold has an anti-ageing effect on the skin, it rejuvenates and nourishes the skin, giving it a long lasting 'youth' glow. Caroline 24K Gold Foil Mask and Gold Radiance Serum (with micro-particles of pure gold) too have great regenerating, hydrating and nourishing effect on the skin. 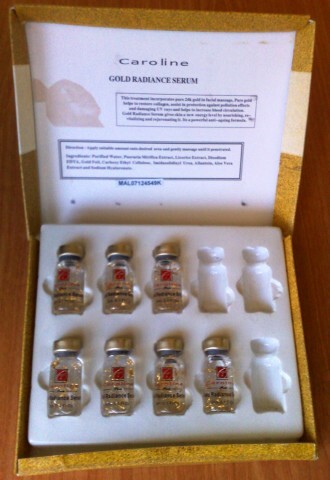 This treatment incorporates pure 24k gold in facial. Pure gold helps to restore collagen, assist in protection against pollution effects and damaging UV rays and helps to increase blood circulation. All natural ingredients used in this treatment rebalance the face and fragrant warm poultices filled with herbs and spices create a truly exotic experience. · Melembapkan dan Menghaluskan Kulit. · Mengurangkan Kedutan dan Garisan Halus. · Memperbaiki Struktur dan Meningkatkan Keanjalan Kulit. 1. Apply a generous amount of Caroline Gold Radiance Serum on fresh cleansed skin. 2. Cut Caroline Gold Foil into 4pcs. and place on forehead, chin and both cheeks. 3. Start to massage (gently) from around the eyes area and continue to cover up and down right to the neck line. 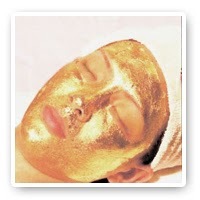 Continue to massage face until all gold foil had been absorbed into the skin. 4. Relax and rest for 15-30mins. New skin cells are being created everyday in the skin’s lower layer, the dermis. Over time, cells migrate to surface and they become saturated with keratin. These dead skin cells cause the skin to become unenven, dry and rough. Exfoliation removes the dead skin cells to reveal the newer skin beneath, this shedding of outer skin layer helps to unclog pores, keeps the skin clean and helps in reducing acne breakouts too. Exfoliation also makes the facial products easier to penetrate into inner skin layer.This caroline milky scrub is for salon professional use. Now you can get it here to do it at home by yourself. This is a gentle milky scrub specifically for use on face. Due to the skin on the face is more delicate than other parts of the body, therefore it requires special attention when it comes to scrub. It leaves your skin noticeably smoother after using this scrub for exfoliation. It contains moisturizing ingredients that keep your skin hydrated, nourish the skin while removing dead skin . *After washing your face, with the water still left on the skin, apply this scrub to keep part of your face(chin, foreheads, nose, cheeks), scrub your face with circular massage for 1 minutes, then wash clean with water. Skin exfoliation needs to be done at least twice a week. 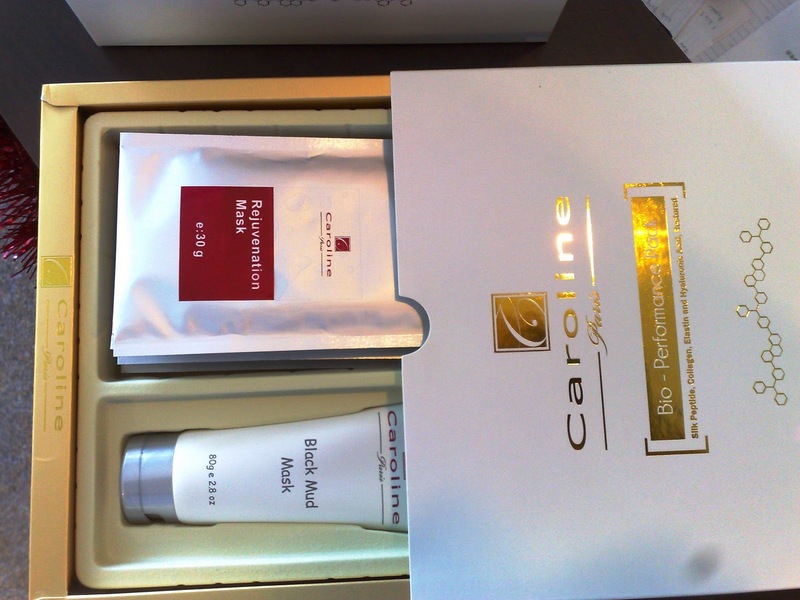 Caroline Soothing Serum is able to normalize the pH balance and provide soothing and calming effects for sensitive skin. It is for sensitive skin which has redness marks problem. It is very useful. 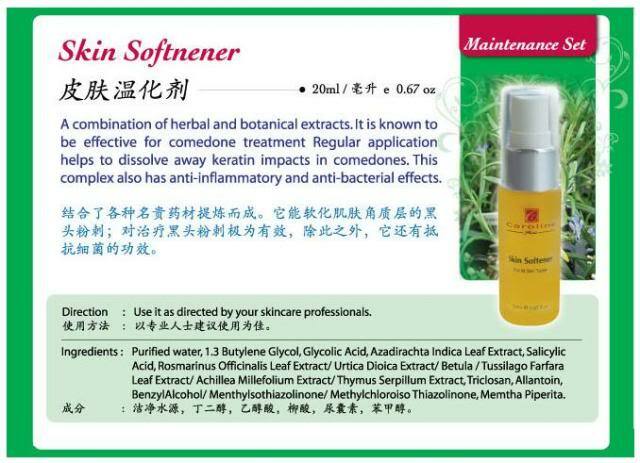 When some skin care cause rednes on ur skin because not suitable, you can apply soothing serum on the redness area. 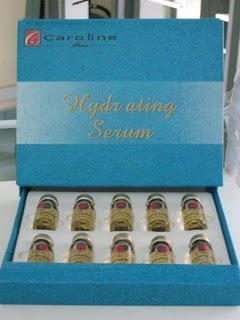 wait all redness gone, then only can apply the skin care again. Water, Chamomilla, Recutita (Matricaria), Extract Imidazolidinyl Urea, Dipropylene Glycol, Glycerin, Allantoin, Acrylamide / Sodium Acryloydimethyltaurate / Acrylic Acid Copolymer.